Microsoft and Intel announced a "validated digital signage platform" that runs Windows Embedded Standard 7 on a 2.4GHz Intel Core i5-520M processor. 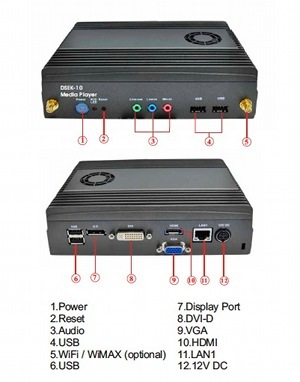 The Digital Signage Evaluation Kit (DSEK-10) is said to include DisplayPort, DVI-D, HDMI, and VGA video outputs, a 2.5-inch hard disk drive, and 802.11a/b/g/n wireless networking. Winmate says the DSEK-10 will be available at the end of this month. Software will include a preinstalled OS image optimized for digital signage usage, plus a recovery DVD, the company says. According to Winmate, the DSEK-10 uses Intel's , one of the embedded-specific CPUs launched by the chipmaker in January. The CPU has a base clock speed of 2.4GHz and Turbo Boost speed of 2.93GHz, dual cores, and a 35-Watt TDP. It's teamed here, as intended, with Intel's QM57 Express chipset. Winmate says the DSEK-10 has 4GB of DDR3 memory, supplied via two SODIMM sockets, plus a 2.5-inch SATA hard disk drive of unspecified capacity. 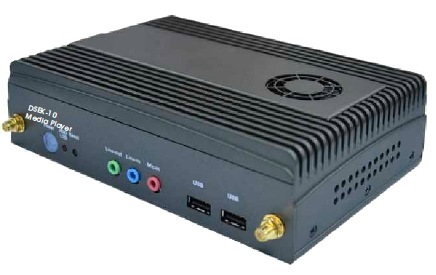 Intel-supplied components also provide gigabit Ethernet and 802.11a/b/g/n wireless networking, the latter via a Mini PCI Express module (WiMax is orderable, the company says).